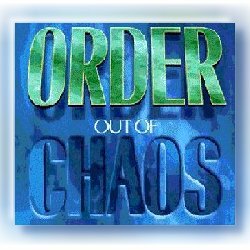 Order out of Chaos -- The revolutionary system for unlimited success!! Practical principles enabling you to overcome the chaotic	conditions controlling your life. One day, a hitchhiker was walking down the road, and a car pulled up beside him. The driver of the car stopped and told the hitchhiker to jump in. Grateful for the ride, the hitchhiker hopped into the car. The speed of the car quickly soared to 90 miles per hour as the driver stepped on the accelerator, pressing it to the floor, wheels spinning. When the driver came to a red light, instead of stopping, he looked both ways and raced right through it. "Man, you're going to get us killed!" screamed the hitchhiker in terror. "Don't worry, my brother taught me to drive," the driver calmly responded, and continued down the road driving 90 miles per hour. Soon, they came to another red light. Again, the driver glanced both ways and zipped through the red light, narrowly missing another car. The hitchhiker was more horrified than before. "Man, you're going to get us killed! ", he yelled. Again, the driver calmly responded, "Don't worry, my brother taught me to drive." They continued down the road going 90 miles per hour, and they came to a green light. The driver stomped on the brake and brought the car to a screeching halt. The hitchhiker shrieked, "Man, you're crazy!" The driver said, "My brother uses this road." Unlike the driver, most people stop at red lights and drive through green lights. Society needs a certain amount of order to function. You can have wealth, happiness, good health, and peace of mind. You can have it TODAY! Order out of Chaos can help you achieve these and more. Inside this book, you will find a revolutionary Bible-centered system that can bring you unlimited success when applied to your life! The system has been proven to work time after time after time. Many people in all walks of life can testify that the practical principles in Order out of Chaos work. This is an offer that will help you bring order to the chaos of your life. If you're sick and tired of being sick and tired, Order out of Chaos is for you! Purchase your copy of this revolutionary system that can bring order to your life. Call 1-800-452-4030 or (937)449-1953. The only thing you stand to lose is the chaos of your life. Watch for the nationally televised special "Order out of Chaos" in your area. Check your local listings because you don't want to miss it! Right choices bring right results! You are the visitor to consider the right choice for ordering your life!